Thirty years ago, when I was just being introduced to metal, female fronted bands were certainly a rarity. I remember listening to the first Warlock albums and marveling at what Doro could do. Things have certainly changed, and now a leading lady is far from uncommonness, and some would even say that the trend became prevalent and beat up. That could be one of the reasons why about a decade ago I have stopped actively seeking bands which would follow in the steps of Nightwish, Epica, etc., not to mention that progressive power metal is probably not the most frequent visitor in my music player. Yet, when Lance King, the founder of Nightmare Records, recommended I give Siren’s Cry a listen I heeded the advice, and I have certainly not regretted it. Hard to say where Siren’s Cry is from. One promo source says Netherlands, another website Austria. It is also not quite obvious why after the original promo (unreleased to the day), recorded in 2002, the band took more than a decade to have their first full-length released, but it is obvious Scattered Horizons took some effort and skills to put together. 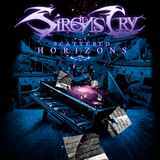 Before critics, who think that progressive metal is more about musicianship and ability to handle the instruments, have a chance to lodge their complaints I will say this – Siren’s Cry on Scattered Horizons is pretty much non-stop intensity and are totally metal. Sure, there are keyboards here, and, sure, the band goes on long forays (Draconian Spectrum, Controversial Mind), which they obviously enjoy and I consider meandering and over the top. Yet, the whole thing, every piece, pretty much resides on solid guitar riffs and syncopated barbs rolling throughout. Add an incredible audible bass, which gets its own solo part in Serpents of War, and this is the foundation atop of which Katarina Bilak has a chance to deliver her Lana Lane-like vocals. Powerful modern production helps to make everything sound crystal clear, but skills and sound is not the only pillars Siren’s Cry rely on. They are not playing these songs for showoff sakes and go out of the way to introduce, in just about every cut, some juicy melodic hook which becomes a centerpiece. S3V3N, Oratory & Sins and Serpents of War have choruses many melodic power metal bands would kill for. With obvious heaviness in them the band visits some mid-Eastern motifs (Oratory & Sins, multi-part Sahara Sagas Pt I), the trend becoming popular in the genre, and something a band like Myrath excels at. Siren’s Cry like to braid in keyboards into their leads (Oratory & Sins) and trade back-and-forth between keys and guitars, only to, once in a while, come up with a totally unexpected jazz moment (Elegy of R’lyeh). Where such sidestep fits, it works great, like in aforementioned Elegy of R’lyeh, but sometimes it makes the song sound bulky (Controversial Mind). I already mentioned that Katarina Bilak in spots reminded me of Lana Lane (S3V3N, Sahara Sagas Pt I), and it is a compliment. When the band’s guitar intensity is actually ratcheted down a bit, she is letting her voice soar, enjoying the romanticism in Cold Amber & Scalding Tears, or taking it to a darker place living up to the ‘elegy’ term in Elegy of R’lyeh. When Siren’s Cry add symphonic touches, they also bring mostly male background vocal layers, going for a broader collective lament (S3V3N, Oratory & Sins, Draconian Spectrum). All in all, Scattered Horizons was a nice refreshing surprise, and I am labeling it as such. Best of all, the moniker of the band really fits its sound. Not that Katarina yells her lungs out, but her beautiful singing is going to lure you in, only to crush against some pretty sharp-edged riffs. Unlike the less lucky ancient Greek sailors I guarantee you will wash up safely on some distant shore and will enjoy both melodicism and professional nature of these newcomers.